Okay, I have only made one scrappy quilt, and it was an "organized" scrappy. Now, after 3 years of quilting, I find myself with lots of scraps (!!!) and no real knowledge of how to deal with them. I tried to do a search for quick scrappy quilts, but got nowhere fast. BUT, I remember reading about several of you who cut up fabric in ____ (?) sized blocks, and then just randomly sew them together. Does this really work? Do they really look okay? I am more than willing to put my scraps into quilts and give them to the charity quilt committee of our guild, but I need someone who knows what they are doing to give me a bit of info so I can get started. I am only an advanced beginner and I am not looking for anything complicated. Does a scrappy rail fence, look good, for example. I can do a rail fence. Check out Bonnie Hunter at Quiltville. I love her scrap system and she makes stunning quilts from scraps. I have a new way to deal with scraps...once they are cut into the sizes Bonnie uses, they aren't scraps any more...they are precuts! So, i never have scraps anymore! I am just finishing her latest scrappy mystery quilt...Easy Street. And it is easy! Check out Bonnie Hunter's website http://quiltville.com/ If you scroll down a little bit on the right is a list of scrappy quilt patterns. They are fabulous! I can't let go of the control of a quilt so I don't do scrappy but I love to see them!!! ETA: Looks like Jo C and I were typing at the same time!!! I am going to try at some point a disappearing 9 patch scrappy but use 1 plain bright Block as unifying factor. I'm going to use a lot of leftovers from binding so I will make one with 2 1/2" squares and one with 2 1/4" squares. That way if I have a plan I know to cut small leftovers in those sizes and keep them together. My favorite scrappy is the log cabin. 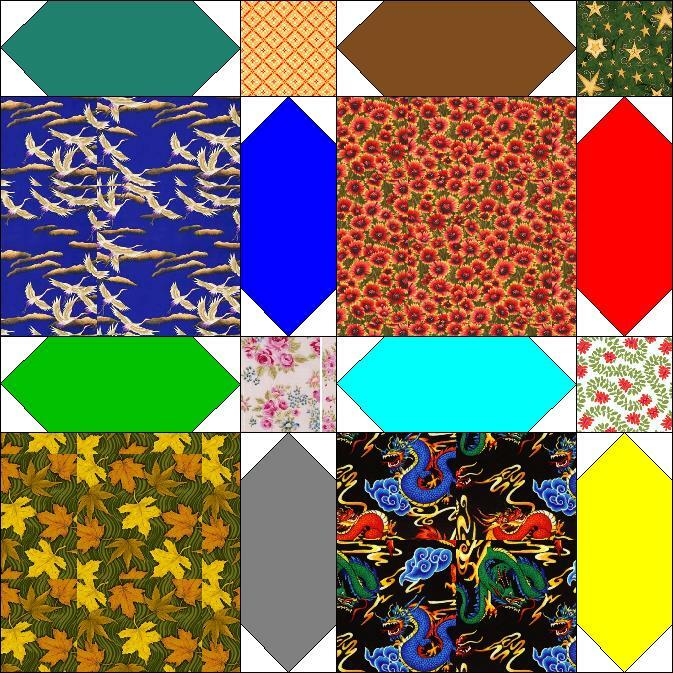 The same log cabin block can make dozens of different looking quilts. Its so versatile! My number one choice for scrappy is log cabin, The results are always beautiful. Use small logs 1 1/2 inch and the colors will just melt together. Just seperate lights and darks. I sometimes use a cream on cream print for the light side to give a neutral place for the eye to rest. I can't share a picture right now, but my fav is called Square Cross or Vestibule. A few years back, I cut all my scraps into usable units, reducing the scraps from 6 boxes to 2.5. Then I saw this pattern. I used squares of 2.5 and 5.5" and 2.5 x 5.5" rectangles. I added 8 1.5" squares of muslin per block. Each block takes 2 rectangles. Make star points on each end with the muslin. Place in the corner and sew diagonally edge to edge, then fold the muslin back on itself to make an eventual sawtooth star point. Repeat for the other 3 corners. Press. Sew one rectangle to the larger square. Sew 2.5" square to an end of the remaining rectangle. Match that seam to the other square/rectangle seam. Sew, making an uneven 4 patch. Lots of suggestions that will help you. Lori S's suggestion about cutting up your scraps into 1.5 inch strips is a good one -- log cabins are perfect for scrappy fabrics. Absolutely check out Quiltville, as the Bonnie Hunter method is the best way to maximize your scraps and have 'ready to go' supplies when you want to whip out some quick, fun quilts. It's so satisfying have all of the cutting done and just getting right into the sewing....I wish I'd started years sooner! Quiltville is a great go-to inspiration site. But http://www.quiltingboard.com/tutoria...een-t6951.html will show you how to use scraps effectively and efficiently without a pattern. When looking, one finds to many ideas that can overload a poor tired brain cell. Just quickly pick the first choice that jumps out to you and go for it. Thanks for all the suggestions. I am still looking at them, trying to decide which to tackle. I like scrappys that have a "unifying" factor. Check out this one I saw on the board recently. I am working on something similar. I am using all different blocks & solid stars in the sashing. You can really mix up your fabrics without much thought, but the unifying factor ties it all together. Thanks. I think I will be happier if I have a unifying factor. This is good information! I first saw this hanging way high on a building at the Sisters, OR outdoor quilt show and had my DH shoot it for me. I have made it 3 times, twice in scraps and once with fussy cut kid prints for a baby quilt. Crumb blocks are, indeed, also a good way to use scraps, although IMHO they are better with sashings, which means they use less of your scraps, unfortunately. Traditionally, they are done on some sort of foundation. My preference is clean "dead" sheets, cut 1/2 to 1" larger than the finished size you want. I sometimes use my larger batting scraps. When I am doing these as cuddle quilts, I begin with a fussy cut central image. On one quilt, they were all dogs. That went for a good price at a local benefit auction.